Our voyage starts in Bergen, a city surrounded by seven mountains. Before departure we may wish to explore this cultural gateway to the fjords. 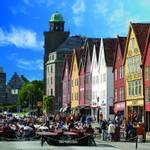 Bergen was founded in 1070 AD, and was the capital of Norway for several years. 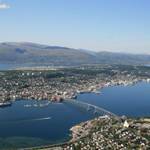 The city is a central point for Norwegian travel, and has retained a great deal of local character and history. One example of this is the historic UNESCO-listed Bryggen district with colourful wharfs that date back to the 14th century. We sail north from Bergen along the Hjeltefjord, the same route the Vikings once plied to the Shetland Islands and beyond, heading to the high north. As we sail past the West Cape, we are out on the open sea. The ship then navigates through skerries and islands before reaching Ålesund. 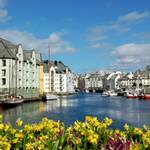 Distinguished by its numerous spires, towers and highly-ornate buildings, Ålesund is a town renowned for its beautiful art nouveau architecture. It owes this to a devastating fire that burned a large proportion of the city to the ground in 1904. The entire town was subsequently rebuilt in the fashionable style of the time, art nouveau. If you like marine life, join us on a visit to Atlanterhavsparken - one of Northern Europe’s largest salt-water aquariums. The tour includes a visit to the open-air pool to see the resident penguins. After visiting Atlanterhavsparken, we continue onwards and upwards to Mount Aksla where you will get an amazing panorama of the area. We can also explore Trondheim from sea level in a kayak along the river Nid or experience Trondheim on a bicycle and try out the world’s only bicycle lift, you can join the Expedition Team for explorer boat activities to discover more of Trondheim and its surroundings. Today we cross the Arctic Circle! This invisible line is situated at 66 degrees 33 minutes north and marks the border to the Arctic Region. In summer, this means 24-hour daylight - often referred to as the ‘midnight sun’. If you are sailing in Arctic waters for the first time, you can participate in a daytime Arctic Circle ceremony on deck. Near Ørnes, you find Svartisen, Norway’s second largest glacier. Join us for a trip to the Svartisen Tourist Centre, where we can admire the beauty of this enigmatic ice world. 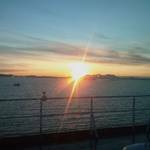 Afterwards, the journey continues along the beautiful coast of Helgeland to Bodø, where we re-join the ship. Tucked between majestic granite cliffs and white sandy beaches, Lofoten is an experience that is out of the ordinary. 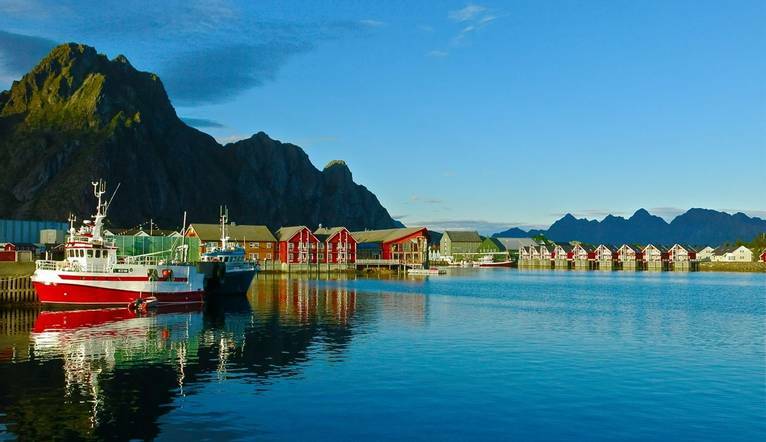 The charms of the Lofoten Islands are revealed in the small, picturesque fishing villages with their bohemian ambience. Take a stroll between stockfish racks and ‘rorbuer’, the traditional fisherman’s huts. At Stamsund, join a historical journey to the Lofotr Viking Museum, where we are invited into the chieftain’s house, a full-size reconstruction featuring exhibits of finds dating back to the Viking Age. Between Stamsund and Svolvær, we have the chance to experience life on a herb and cheese farm in Lofoten, or visit the Lofoten’s only craft brewery, situated in an old fish landing facility. Get ready for a day full of exciting activities – during the morning hours, we briefly dock at Risøyhamn, Harstad and Finnsnes. The ship then continues to Tromsø, `Capital of the Arctic´, for a prolonged stay. Many epic Arctic expeditions used Tromsø as a starting point. If you want to experience peace and tranquillity on the sea, why not join us for a kayaking excursion? Paddle in the waters off the Tromsø coastline with the mountains as a stunning backdrop. This is a great way to silently glide through these pristine waters and get close to marine wildlife. Speaking of silent, we can join a silent winter whale exploration tour in the waters of Kaldfjorden. Guided by an expert crew trained in responsible wildlife tourism, we are transported by Opal, a carbon-neutral oak sailing boat. The only sound we hear are whales surfacing and spraying water from their blowholes, as well as our heart beating a little bit faster than normal. After an exhilarating day in Tromsø, we continue our northbound journey. Enjoy magnificent sub-Arctic landscape as we cross the 71st parallel on our journey towards North Cape, one of the northernmost points on the European continent. 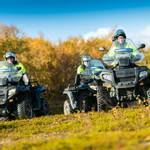 We may see herds of grazing reindeer and small camps belonging to the indigenous Sámi people. After brief early stops in Hammerfest and Havøysund, we arrive in Honningsvåg, the gateway to the spectacular North Cape. An optional excursion to the North Cape plateau puts you at 71°10’21´N, only 2,000 km away from the geographic North Pole. Standing on top the 307 m high North Cape plateau imparts a sublime sense of being at the end of the world. While admiring the view, make sure you get some photographic evidence of this amazing place. 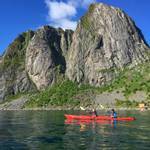 Close to North Cape you find one of the world’s most exciting nature reserves, Gjesværstappan. 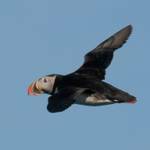 Join a bird-watching safari to experience Finnmark’s largest flock of puffins, together with large numbers of kittiwakes. During the nesting season, this area is teeming with life, and mighty sea eagles hover above in search of prey. Meanwhile guillemots, razorbills, cormorants, Arctic skuas, northern fulmars, Bru¨nnich’s guillemots, and the large northern gannet fill the air with a cacophony of shrieks and screeches. The ship then continues north, sailing into the heartland of the indigenous Sámi people. We pass their ancient sacred site, the rock formation Finnkirka, as we approach our next stop, the fishing village Kjøllefjord. Here we have the opportunity to learn more about the Sámi people, as well as to explore the wonderful landscape. Learn about Sámi traditions and their way of life, and hear traditional Sámi joiking (song). As we depart Kirkenes, you’ve only seen half of what our voyage along the Norwegian coastline has to offer. Prepare yourself for many new experiences. The ports previously visited by night on the northbound journey are now seen by day. In the afternoon, the ship again docks at Vardø, Norway’s easternmost port. Weather permitting, we may invite you to experience ice bathing in the Arctic Ocean. Heading south, we cruise along the Varanger peninsula to Båtsfjord, before reaching Berlevåg in the evening. The latter town is home to one of Norway’s most famous male choirs, consisting mainly of local fishermen. At Honningsvåg, we can join an excursion that features breakfast at North Cape and the discovery of hidden parts of Finnmark along the way. Before stopping in Hammerfest, we can enjoy an ‘energy coffee’ and short on-board introduction to Melkøya - the world´s northernmost natural gas terminal’. In autumn, we invite you to taste dried-reindeer meat on deck. Hammerfest was founded in 1789, and over time became Norway’s polar capital, serving as a base for hunting expeditions into the high Arctic. Here we can see the UNESCO-listed Meridian Column, erected in 1854 to commemorate the first precise, geographic measurement of the globe. You can also join a mini-mountain expedition to experience the Arctic outdoors and learn about local polar hero and cook, Adolf Henrik Lindstrøm. We arrive at Harstad this morning, where you have the opportunity to participate in one of the classic Hurtigruten excursion programmes: A taste of Vesterålen. Experience history, beautiful scenery and a selection of breathtaking sites that include a visit to Trondenes Church, one of Norway’s premier cultural heritage sites from the late Middle Ages. Those who choose to stay on board can admire views of this old church as we sail towards the Risøyrenna, a shallow 7m-deep channel made especially for Hurtigruten in the 1920s to provide an ‘inside route’ between Harstad and Sortland. The sand banks along the Risøyrenna are visible through the clear, green water. The island groups of Lofoten and Vesterålen offer some of the most stunning scenery you will see during the entire coastal voyage. The Lofoten region is renowned for its natural beauty with steep mountains, wild nature and small, picturesque fishing villages. 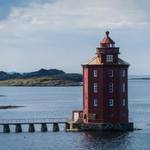 The daylight sailing route through the Lofoten Islands is a highlight for many. Now we reach the spectacular Trollfjord, only 2 km long and 100 m wide, surrounded by majestic mountains. If the weather and time permit – the captain makes a detour into the fjord. Steep cliffs hug the ship´s sides and the dramatic landscape conjures fairy tale images of an imaginary land of trolls. Trollfjord is also the realm of the sea eagle. Just north of the fjord, a smaller vessel awaits to take you out to see this magnificent bird up close on an optional sea eagle safari. To join the safari, you transfer to the smaller tour boat on Trollfjord. To do this, the Hurtigruten ship must turn around in the narrow fjord, a magnificent sight in its own right! The eagle safari begins in earnest after leaving the Trollfjord, passing through narrow channels flanked by steep mountains where the sea eagles can be viewed. These beautiful, rare birds of prey circle the boat a few times before we toss fish into the sea for them to grab and devour. 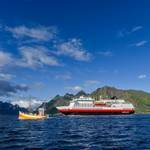 Reaching Svolvær, we can choose from several excursion options. 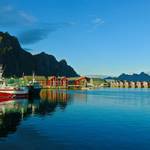 Join our Lofoten Islands tour to learn more about the fishing communities, beautiful scenery and art from this area. From Svolvær, we continue on to Stamsund, where we see the majestic peaks of the huge Lofoten wall. We leave Lofoten during the evening and set course for the mainland. Crossing the Arctic Circle at 66°33’N is an important ‘rite of passage’. Today we celebrate the event out on deck with a `taste´ of Arctic tradition – a spoonful of cod liver oil. As we sail along the Helgeland coast, you pass hundreds of islets, fertile farmland and steep granite walls rich in local lore. On deck you can see the strange mountain Torghatten (rising 258 m above sea level), famous for its distinctive hole right through the middle. Another highlight is sailing past the Seven Sisters mountain range. Next we make a short stop at Nesna, an idyllic old trading post before moving on to Sandnessjøen. The UNESCO World Heritage Site of the Vega Islands is close to Sandnessjøen and can be visited on an optional excursion during summer. Today provides another opportunity to explore the city of Trondheim. Join the Explorer Team to discover even more of the surroundings on explorer boat activities offered. Back on board, the ship heads out into the majestic Trondheimsfjord, which is 170 km long and up to 25 km wide. Like all other Norwegian fjords, it is deep, plunging to 577 m.
As we sail along the coast, you realise the importance of fish to Norwegian coastal communities. Kristiansund’s location has steadily provided the town with a wealth of opportunities in the fishing, shipbuilding and oil industries. Here you can join an excursion to the renowned Atlantic Road, one of Norway’s most visited tourist destinations. It is 8.2 km long, built on a total of eight bridges and surrounded by picturesque landscapes and open sea. You can also choose a sightseeing tour of Kristiansund, and visit Kvernes Stave Church on the nearby island of Averøy. 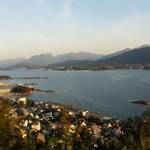 During the night, the ship calls at Ålesund, Torvik, Måløy, as the world’s most beautiful voyage draws to a close. Before we dock in Bergen, there are some nautical miles of fascinating scenery ahead of us, including the picturesque Nordfjord below the enormous Jostedal Glacier. Here the fjord widens to the east and forges 90 km inland to Loen and Olden. The rugged coastal areas are a striking contrast to the inner fjord regions where the wind is gentler and less rain falls. In the morning, we call at Florø, a modern coastal seaport that is also the Sogn og Fjordane region´s oldest town and Norway’s westernmost community. Despite constant changes, the city of Florø has maintained its special features. A few nautical miles south of Florø, we navigate the mouth of the mighty Sognefjord, and enjoy superb views of this magnificent island-studded coastline en route. Finally, we disembark in Bergen. MS Finnmarken is beautifully appointed and decorated in the Art Deco style that was fashionable when the first ship with this name was built. Rich colours, bold geometric shapes and lavish ornamentation characteristic of the Art Deco style are found throughout the vessel. MS Finnmarken is also the only Hurtigruten ship with both a swimming pool and Jacuzzi on deck. A defining feature of the vessel is her bow, and from deck 5 you can venture to the very tip of the ship. Facilities include, on board expedition team, swimming pool and Jacuzzi, panorama lounge, fitness room, sauna with a view, bar, library, conference room, café, a la carte restaurant and buffet restaurant. Wi-Fi is also available on board. Our cosy Polar inside cabins are on decks 2, 3, 5 and 6. All cabins include bathrooms with shower/WC. Most have separate beds, one of which converts into a sofa, or upper and lower berths. All of the cabins have individual specifications. Upgrades are available for outside and superior outside cabins.